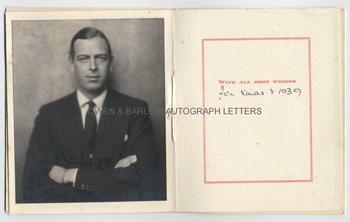 GEORGE, DUKE OF KENT Photograph SIGNED. Prince George Edward Alexander Edmund, son of George V and brother of George VI and Edward VIII. 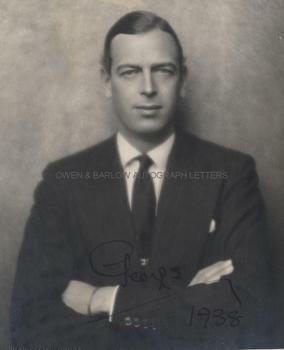 Photograph, signed and dated "George, 1938". Contained within a Christmas card which is inscribed in his hand "For Xmas & 1939" below the printed greeting "With all best wishes". 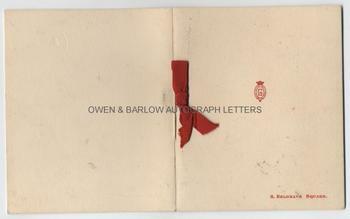 The card, bound with chord and red ribbon, bears his printed monogram on cover and the address, 3 Belgrave Square. It shows the handsome 36 year old Prince half length, in lounge suit, facing the camera, with arms folded. The photographer was Hugh Cecil, London and his small blind stamp is at the bottom left corner of the image. The photograph measures 5.5 x 4.5 inches. One or two very slight marks to the ivory card cover but all else in fine condition. George Duke of Kent was, like his brother, Edward VIII, one of the more colourful and controversial members of the British Royal Family. He is rumoured to have had affairs with numerous men and women, including Noel Coward, Jesse Matthews, Barbara Cartland, Louis Ferdinand of Prussia, the spy Anthony Blunt, and various other socialites and Hollywood stars. He is also said to have been addicted to morphine and cocaine. He served in both the Navy and the Air Force and was the first member of the Royal Family to be a Civil Servant, when he spent time at the Foreign and Home Offices. He was to have been appointed Governor-General of Australia in 1939 but this was postponed when World War II broke out. At the date this photograph was taken, the Duke of Kent was back in the Forces and serving in Naval Intelligence. He was killed in 1942 when his flying boat crashed into a mountain in Scotland en route for Newfoundland. The Duke of Kent was always a short step away from scandal and disaster and, needless to say, the circumstances of his life and death have been rich ground for conspiracy theorists.